Every now and then I need to find the version and build number of VMware vSphere Update Manager that is running in a customer’s environment. I’ve written this post mainly as a reminder to myself, but hopefully it helps someone else down the track. 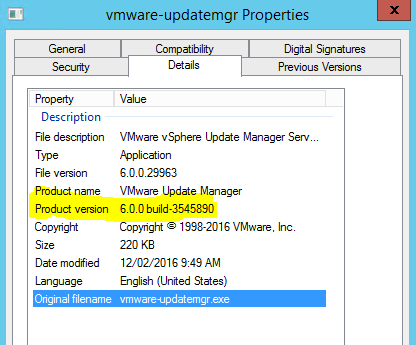 VMware have a KB article for most of their products to correlate the build numbers with versions. The specific article for VUM is KB 2143837. Sometimes these aren’t always right up to date unfortunately. As you may notice, 6.0.0.29963 does not correlate to any of the builds listed in the KB article. After opening it up, the first line will list the full version and build (see below), which we can then then use to cross check in the original KB article I linked to. In this instance below, we’re looking at an install of VUM 6.0 U2. Unfortunately I haven’t had a chance to play with vSphere 6.5 yet, but VUM is now included and enabled by default in the VCSA which is easily the preferred deployment method for VC with the additional features added in 6.5. I’ll need to confirm, but I assume that for VUM on the VCSA, you’ll be able to determine the build number by confirming the version of vCenter itself, as the VUM component will be updated as patches and updates are applied to the appliance.